After a night of revelry with friends, there’s not much that can get me excited about crawling out from under my covers the next day. One thing that can is the Winter Classic. It doesn’t really matter which teams are playing or which historic stadium is featured. I don’t even really care who wins most times. It is just another two points, after all. 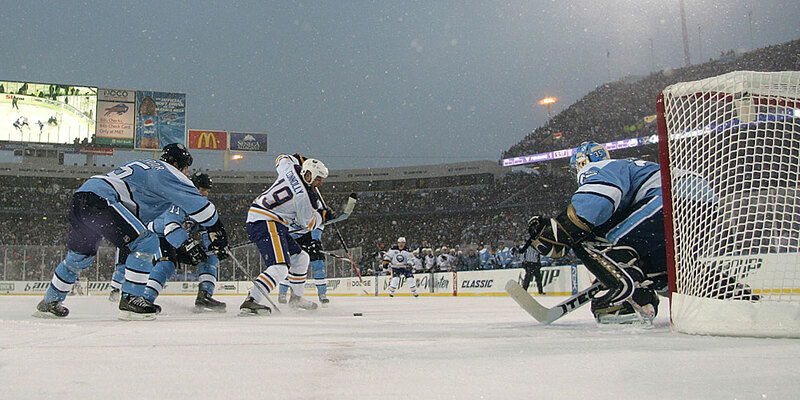 The first Winter Classic played in Buffalo. Or the best one thus far. What gets me excited is the idea of my favorite game in the world getting some air time on a national holiday. I love the idea that some kids might watch their first hockey game that day. It thrills me when a hockey game is nationally broadcast on a major cable network. The attention is fabulous. A belated Merry Christmas to my readers! I hope you all had a joyful holiday spent with family and friends. I certainly did! 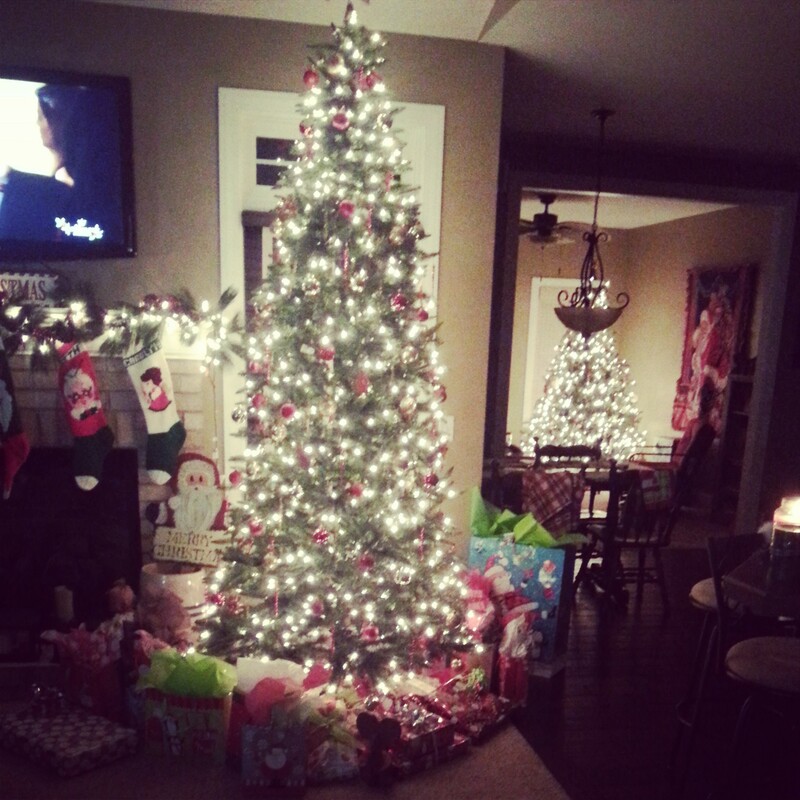 My mom does Christmas right. I’ve been so full of holiday cheer this month that I haven’t been taking the time to post, and now I’ve completely missed the boat on sharing my Boston/Pittsburgh suspension thoughts. The short version: I think both Thornton and Neal could have been given longer suspensions. Here’s hoping they’ll be smarter in the future – or at least make better post-game comments. I don’t know which was worse – Thornton trying to act like he felt bad or Neal not caring at all. I hope they both enjoyed brushing up on media training that week. Last month I went to my first Lake Erie Monsters game of the season. Now that I’m living in Greater Cleveland, it’s about time I got myself to the Q for a hockey night in CLE. I went to a few games when I was in college, but I haven’t been back since then. But between moving to the area and gaining access to a corporate suite, I was sold. 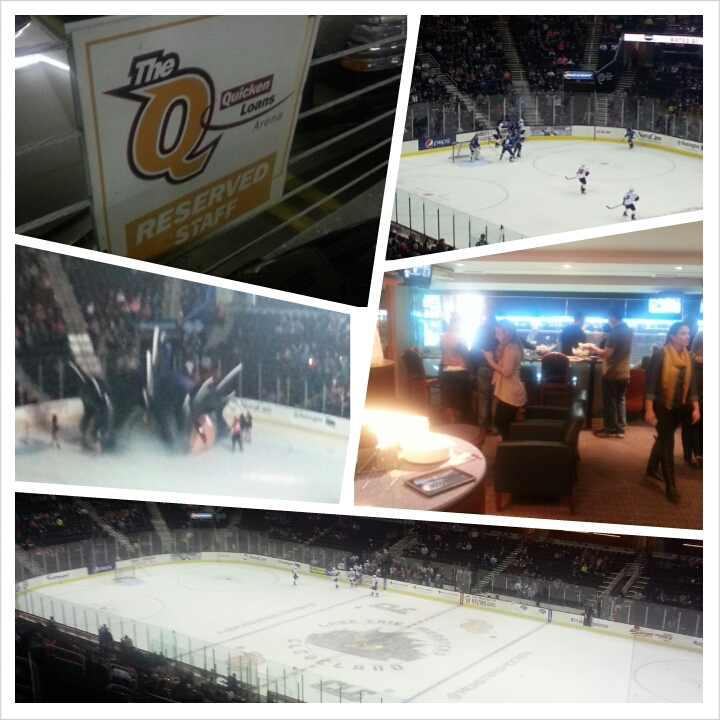 The company I moved to Cleveland for has a suite at the Q, and I snagged four tickets to a weeknight game. I went with three work friends, and we had such a great time. I could get used to the suite life real quick. 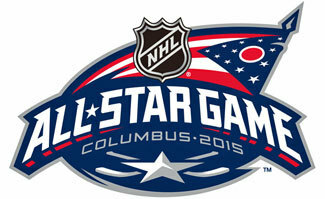 Columbus will host the 2015 NHL All-Star Game. It’s only right that Columbus finally gets its chance to welcome all of the league’s best players for a weekend of skills challenges and many, many goals. I live just a few hours away from Columbus, and I’m always intrigued by their fanbase. In theory, Columbus should be the perfect place for a hockey team. It’s located between Pittsburgh and Detroit – two cities obsessed with their hockey teams. However, Columbus has never quite reached that level of fanaticism for the Blue Jackets. I recently discovered a junior hockey team called the Drummondville Voltigeurs (“Infantrymen”) from Quebec. The team plays in the Quebec Major Junior Hockey League, and most of its players were born in the mid-90s. They have participated in the Memorial Cup tournament three times – once the year I was born. I don’t think this is just a coincidence. 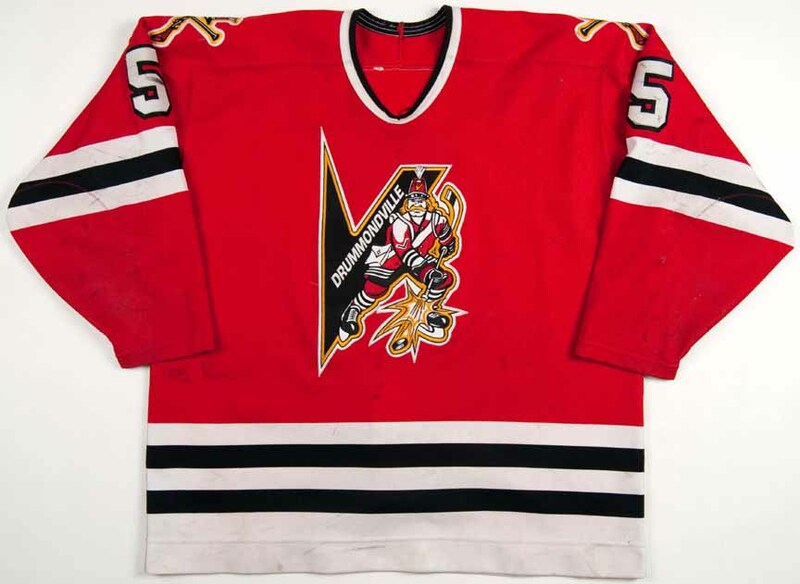 A Drummondville jersey. I like the red with stripes across the bottom like the Blackhawks design. Charlie Conway was the greatest sports hero of my childhood. The Bash Brothers were the first bad boys I ever loved. And the Mighty Ducks introduced me to ice hockey. Then I forgot all about hockey until I was reintroduced to it in college, but that’s another story for another day. As a child of the 90s, the Mighty Ducks are one of my favorite sports teams of all time. By association, a small part of me respects the Anaheim Ducks organization. That grows exponentially on throwback jersey nights. Just a few weeks ago the Ducks paid tribute to their humble beginning as a team created by Disney. They pulled on the eggplant and teal sweaters, played 90s music throughout the arena, and even offered a 93-cent menu in honor of the year the team first took to the ice in California. 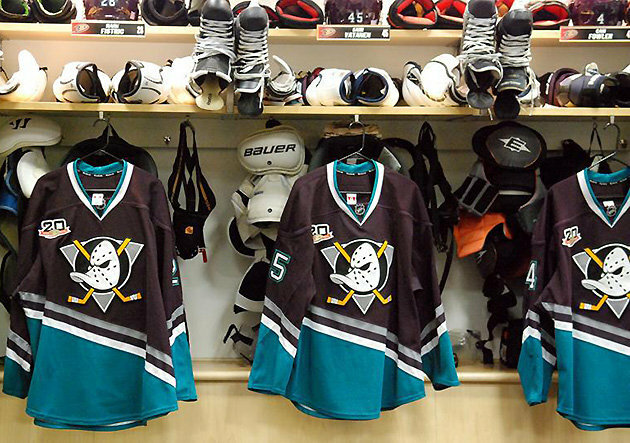 Throwback jerseys hanging in the Anaheim Ducks locker room before the tribute game. Photo courtesy of Puck Daddy blog. October is Hockey Fights Cancer Month in the NHL. The movement, which began in 1998, brings all of the teams in the league together to raise awareness and money for cancer-related organizations and research. In addition to league-wide promotions and purple apparel, each team hosts its own Hockey Fights Cancer Awareness Night. 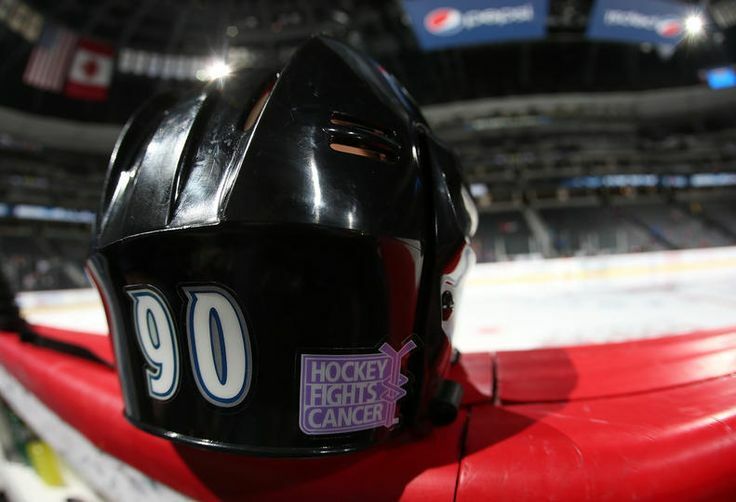 A Colorado Avalanche helmet sporting the Hockey Fights Cancer logo. Photo courtesy of NHL Pinterest page.